In quantum mechanics, a state that is not truly stationary but is almost stationary. (in thermodynamics), a state of unstable equilibrium of a physical macroscopic system in which the system may remain for a long period. A superheated or super-cooled liquid or a supercooled (supersaturated) vapor are examples of metastable states. A liquid such as water, from which extraneous solid particles and gas bubbles (vaporization centers) have been carefully removed, can be heated to a temperature exceeding the boiling point at a given pressure. If vaporization centers arise in the superheated liquid or are introduced artificially, the liquid vaporizes explosively (vapor is the stable state at the given temperature). In turn, vapor in which there are no condensation centers (solid particles or ions) can be cooled to temperatures at which the liquid state is stable, producing a supercooled (supersaturated) vapor. For example, in nature supersaturated steam is formed when air masses heated on the surface of the earth rise and subsequently are cooled by adiabatic expansion. The occurrence of metastable states is explained by the theory of thermodynamic equilibrium. The maximum entropy S corresponds to the state of equilibrium of a closed system. For constant volume V and temperature T, the minimum free energy F (the Helmholtz energy) corresponds to equilibrium, and for constant pressure p and temperature T the minimum thermodynamic potential G (the Gibbs energy) corresponds to equilibrium. 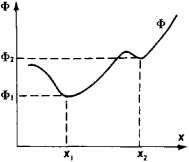 However, several extrema (maxima or minima) of one of the functions listed above (see Figure 1) may correspond to certain values of the external parameters (such as p, V, and T). A state that is stable with respect to small effects or fluctuations corresponds to each of the relative minima of the function F or G. Such states are said to be metastable. Upon a slight deviation from the metastable state, a system reverts to the same state, but it is unstable with respect to large deviations from equilibrium and passes into a state with an absolute minimum thermodynamic potential, which is stable with respect to finite deviations of the values of the physical parameters from the equilibrium values. Thus, although a metastable state is stable within known limits, the system will eventually enter an absolutely stable state. Figure 1.Φ1(x1) is the absolute minimum of the function Φ (the potentials F or G may be the function), Φ2(x2) is the relative minimum of the function, and x is a variable physical parameter (such as the volume V); the other parameters are constant. The possibility of achieving a metastable state is associated with the peculiarities of the transition of a system from one stable state to another (with the kinetics of phase transitions). A phase transition begins with the appearance of the nuclei of the new phase (vapor bubbles in the case of a transition of a liquid into a vapor, microcrystals in the transition of a liquid into the crystalline state, and so on). The formation of nuclei requires the performance of work to create interfaces between the two phases. The significant curvature of the surface of the nuclei impedes their growth as they form and leads to increased solubility of the solid-phase nuclei upon crystallization, to evaporation of small drops upon condensation of the liquid, and to increased elasticity of the vapor within the small bubbles upon vaporization. These factors may make the appearance and growth of the nuclei of the new phase disadvantageous in terms of energy and restrain the transition of the system from the metastable state into an absolutely stable state under given conditions. Metastable states are widespread in nature and are used in science and technology. For example, the phenomena of magnetic, electrical, and elastic hysteresis, the formation of super-saturated solutions, the tempering of steel, and the production of glass are connected with the existence of metastable states. Landau, L. D., and E. M. Ltfshits.Statisticheskaia fizika. Moscow, 1964. Shtrauf, E. A. Molekuliarnaia fizika. Moscow-Leningrad, 1949. Samoilovich, A. G. Termodinamika i statisticheskaia fizika, 2nd ed. Moscow, 1955. Skripov, V. P. MetastabHynaia zhidkost\ Moscow, 1972. An excited stationary energy state whose lifetime is unusually long. However, some special states may live much longer, up to several seconds or more before they decay, and are therefore called metastable states. Unfortunately some of the noise is due to spontaneous decay of atoms from a metastable state and affects phase as well as amplitude. However, upon termination of the light, the drain current decayed and settled to a metastable state, which was the store/read state as a function of time. Japan) discuss energy splitting, or tunneling splitting, in symmetric double well potential; the decay of the metastable state through tunneling; tunneling effects in chemical reactions; and other tunneling phenomena. It is relatively easy to prepare a liquid in the metastable state well below the melting temperature. This is because charge transfer is induced by light, and the resultant metastable state could be trapped at low temperature. The metastable state could remain crystalline in this case" . Because of the high energy of the metastable state of [He. Starting with a general discussion of reliability in digital processors, the book goes on to look at the evolution of synchronizer hardware and the concept of a metastable state, where a circuit is caught between a one and a zero. These parts of the lithosphere exist in a metastable state and are mechanically strong. When a liquid is subjected to a negative pressure, which leads to a metastable state, vapor bubbles can be created and grow until the pressure inside the bubble reaches the equilibrium vapor pressure. Besides display quality, another very important characteristic that enables an oscilloscope to capture and show events such as this infrequent metastable state is the waveform update rate.